Global travel has been a major influence in interior design simply because of people’s wider exposure to Eastern cultures through social media and frequent flyer miles :). For years western travelers would visit an exotic place such as India or China, only to bring back trinkets and souvenirs to place in their homes as a symbol of where they have been. This melting pot of cultures is a beautiful thing and home decor is one area that fully embraces this union of East and West. At Designer Custom Source we are always on the prowl looking for great prints, floral designs and now, more global fabric looks which are trending as we speak. We are seeing more fabrics leaning toward ethnic styles and influences in interiors that even if you don’t travel, creating a room that implies what an amazing world traveler you are – is so in! Be in the now and start customizing your living space with great global fabrics on pillows, bedding, draperies and cushions! Start filling up your room with worldly and international influences by simply adding pops of pillows dressed in cultural gorgeous fabrics on sofas, chairs and window seat areas. Our outstanding array of colors, motifs and textures will definitely motivate you to get outside your comfort zone and bring an ethnic flare to rooms. Above (top left to right) we have Robert Allen Rajita Tiger Persimmon, Highland Taylor Water Color Poppy, Highland Taylor Shi Spice, Highland Taylor Teahouse Red and Highland Taylor Florence Punch. Look for your favorite colorways to match the desired look to interiors. You can be a little more subtle by staying within the same colorways such as these Highland Taylor textiles (Teahouse Black , Asia Gold and Shi Grey). 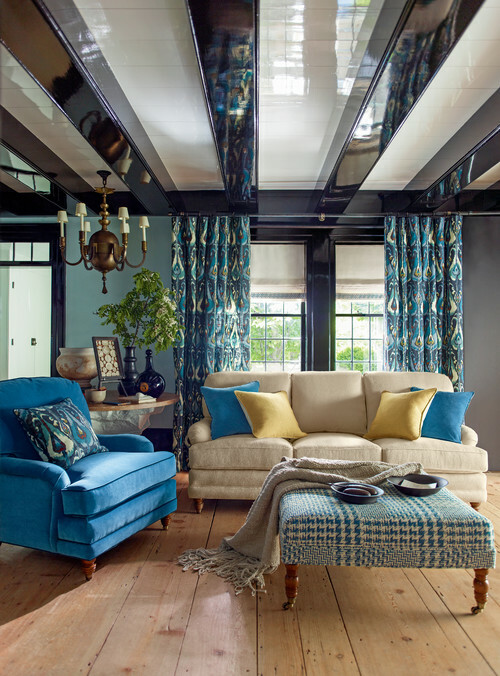 As you stroll through our fabric tool you will come across an amazing selection of Robert Allen fabrics. They truly know how to devote a textile line to world travel. Robert Allen’s use of prints, stripes and tribal motifs in this bedroom make it interesting, a bit wild and definitely tell a story. This bedroom is an example of great pattern mixing with bold richness of color. If this is too bold for your taste, try adding your global fabrics to just one long bed bolster, or create an elaborate headboard with a tribal feel, paired with neutral fabrics to keep the headboard front and center in your space. Or add an accent wall of draperies to give ambiance and help generate mood rather than painting or wallpapering a wall. I call this Polyvore board Boho Chic Medallions for a reason. True bohemians are more unconventional, free, artistic and live adventurously. I would not usually consider myself a bohemian kind of girl but the new modern twist of Suzanni prints on furnishings, patch work fabrics and accent pieces scream world travel which are really appealing and down right dazzling! All in all, I say this global look that seems to be catching on is groovy to say the least and a must have for homes that are looking for a unique, eclectic and diverse fashion to rooms. This Robert Allen Ming Dragon Persimmon chair cushion from houzz is a statement fabric for cushions, window seats and sofas. It has such presence and a real appeal to those who want a culture boost to interiors. Robert Allen Ikat Bands Indigo looks stunning in this transitional living room. I appreciate how the designer brought an ethnic looking fabric and used it with restraint so that it’s not overwhelming to the eyes. The teal and yellow color combos are divine. Love the gorgeous upholstered plaid ottoman coffee table.